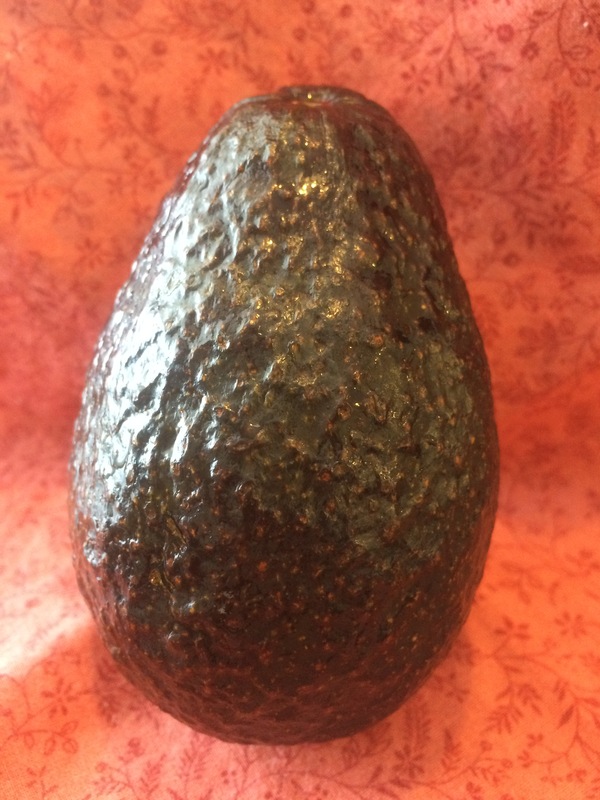 Ok, I must make a confession….this post is really an elaborate ruse to tell the world about my torrid love affair with the avocado. I cannot live without avocado. Anywhere I go, wherever I am, I must seek it out and embrace it. Any meal is made complete by its presence, my waking moments are consumed with memories of our every encounter. It’s love I tell you! 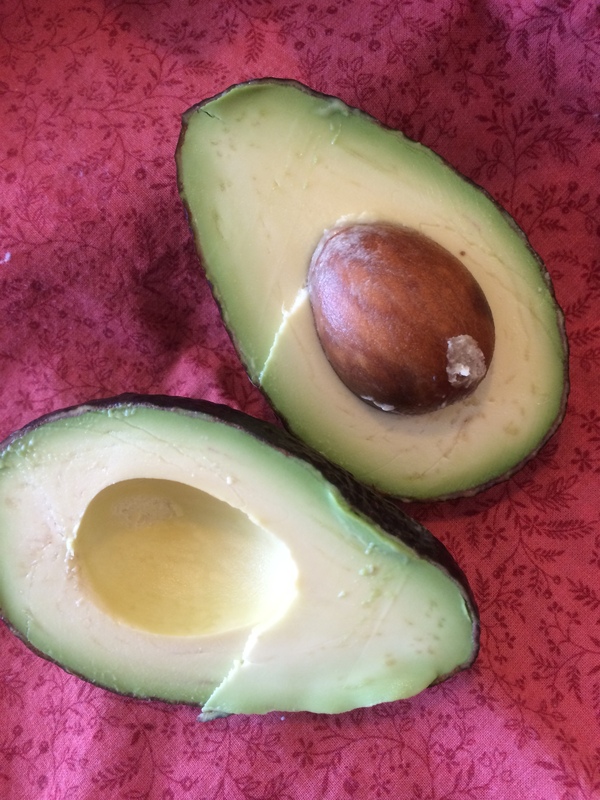 With an avocado in the cupboard…. I’ve got sunshiiiiiine on a cloudy day. When it’s cold outside (and this morning was minus-freakin-30 in case you wanted to know)….I’ve got the month of May. What can make me feel this way???? OK enough. I think I’ve made my point. 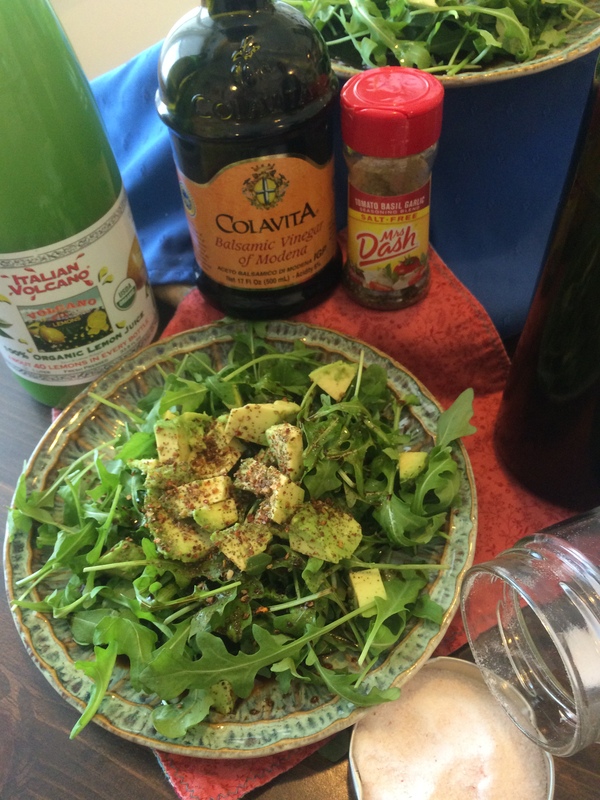 In today’s post, the nutty creaminess of avocado marries peppery arugula, tangy citrus, and sweet balsamic, (plus my favorite shortcut spice blend)–and delivers a bright conglomeration of flavors that never fails to chase away my winter blues. Cut through each half gently into 1/2 inch cubes. At the end run your knife around the skin also. 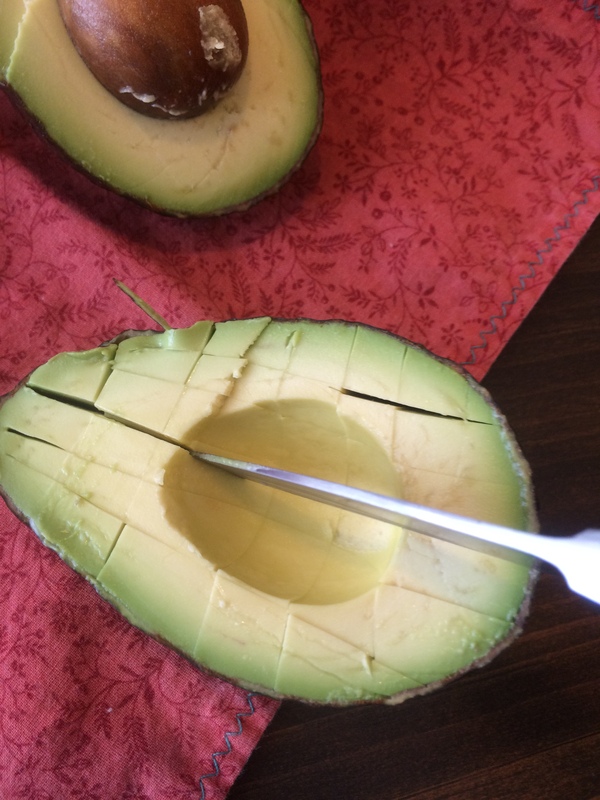 Then slip a spoon just inside the skin, and loosen the avocado in a gentle back & forth motion. Easy peasy. 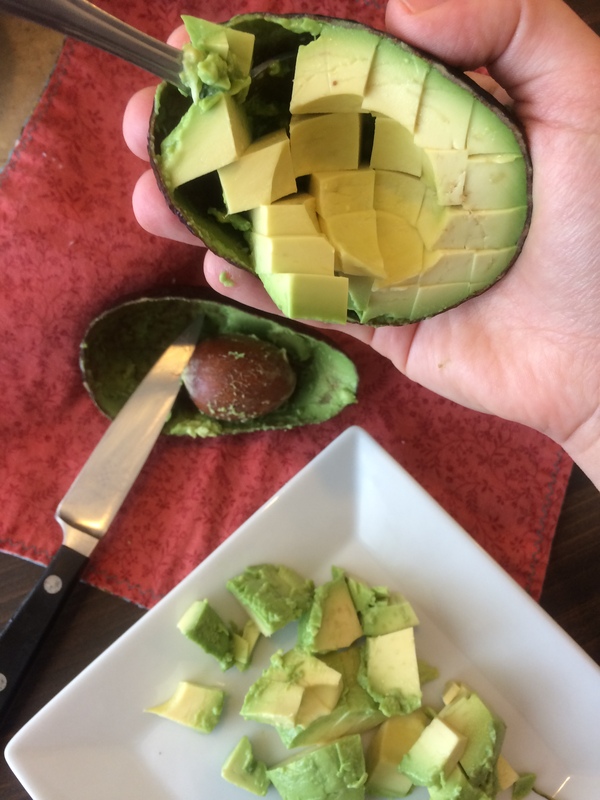 Cutting the avocado is probably the most complex part of the whole recipe. 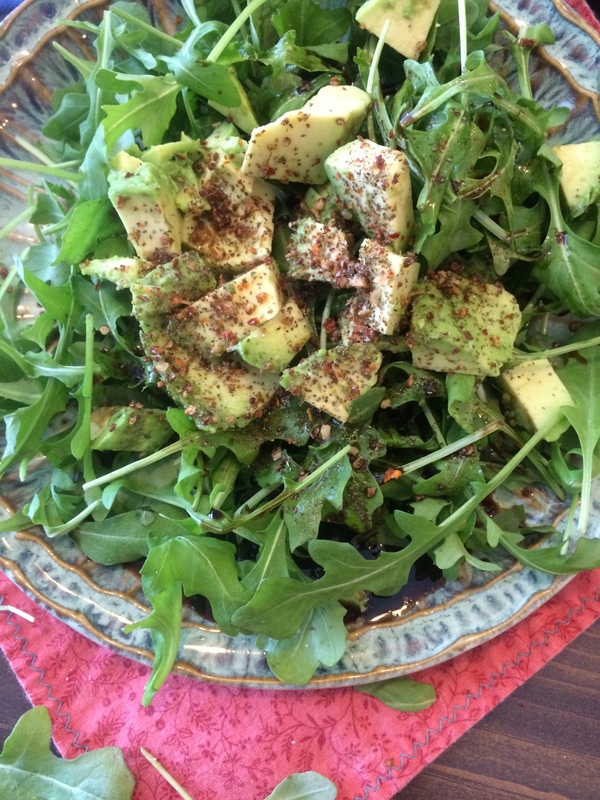 Now all you do is pile a couple generous handfuls of arugula on a pair of salad plates. 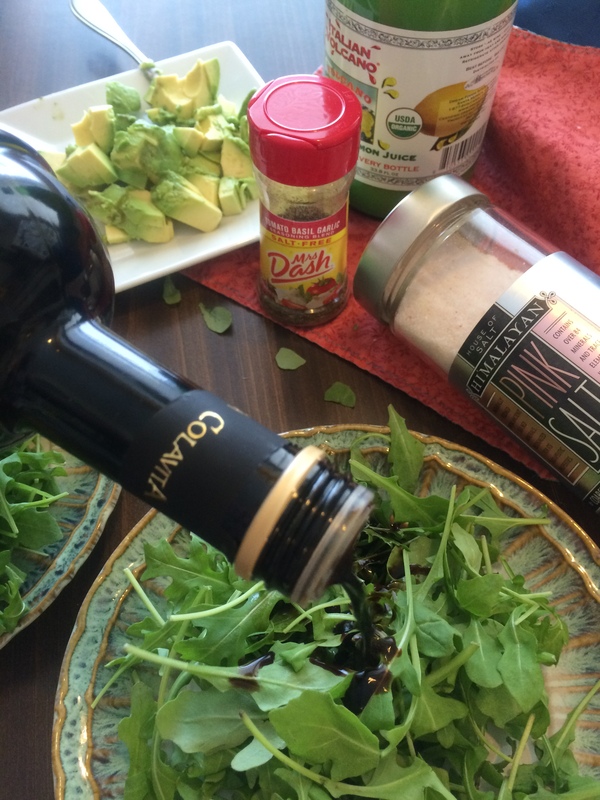 Then you drizzle lightly with balsamic vinegar and olive oil. And now comes my second secret: today’s feature is brought to life by a pre-made spice blend. Those who know me are aware I will usually spend twice as much time and effort making something on the principle that it’s not as fun to buy it at the store, and a home-made version always tastes better. But this is an exception. I’m talking about Mrs. 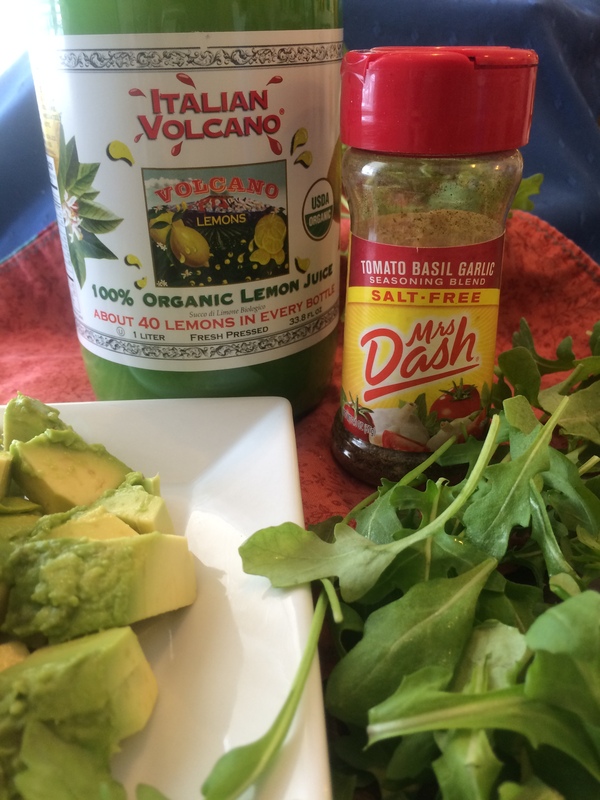 Dash Tomato Basil Garlic blend. This magical spice mix is what fairy dust should be made of. It’s all your childhood summers condensed into a shaker. It’s the real reason Anthony fell so hard for Cleopatra. I swear Mrs. Dash must put crack in this stuff, cuz I want to sprinkle it on everything. Especially on this salad. Sprinkle it on with gusto. Your tastebuds will explode with gratitude. And then divide the avocado between the two plates, and drizzle a bit of lemon juice. Then sprinkle more Tomato Basil Garlic. Sprinkle like it’s going out of style. And finally, dust a bit of unrefined sea salt and you’re done! Enjoy it with some grilled chicken, or maybe this baked salmon…. And although this technically makes two servings…if you’re not in the mood for sharing, feel free to eat eat the whole thing…I won’t tell, I promise. 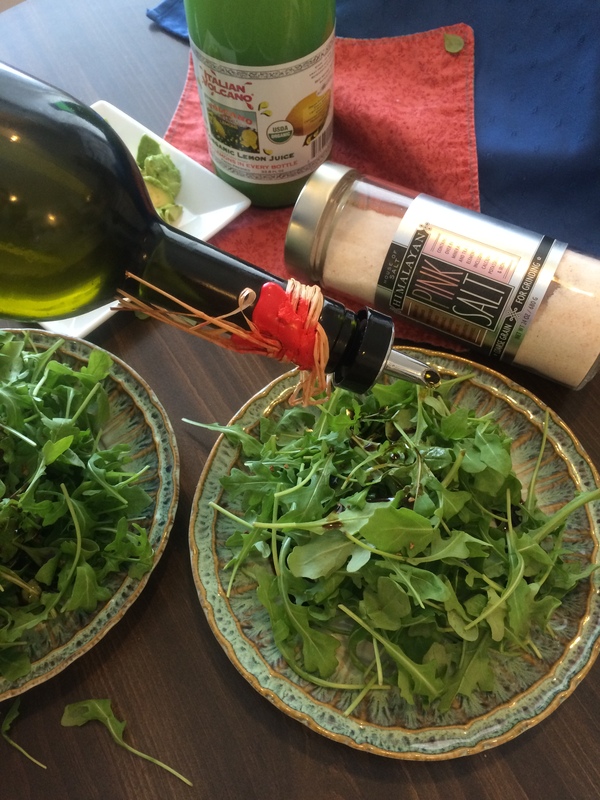 Divide arugula between two salad plates. 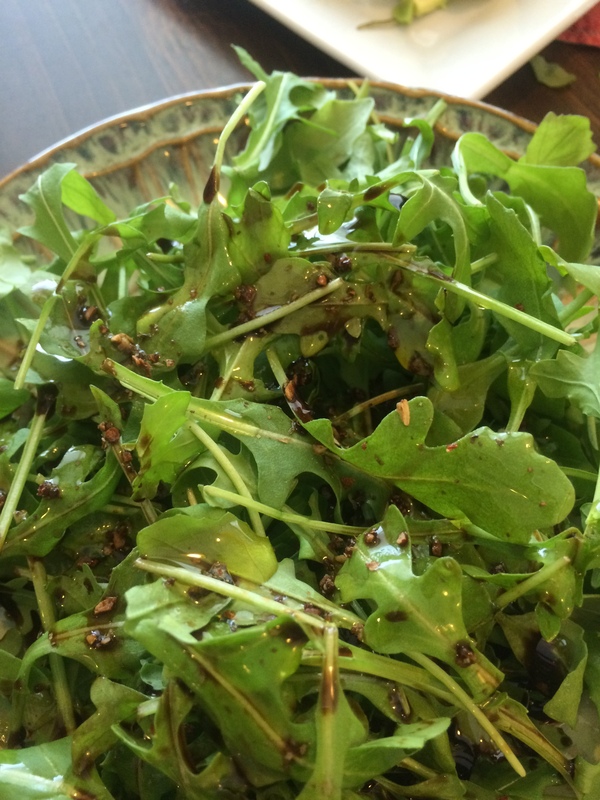 Drizzle with olive oil & balsamic vinegar. Sprinkle with seasoning blend and lay avocado cubes on top. 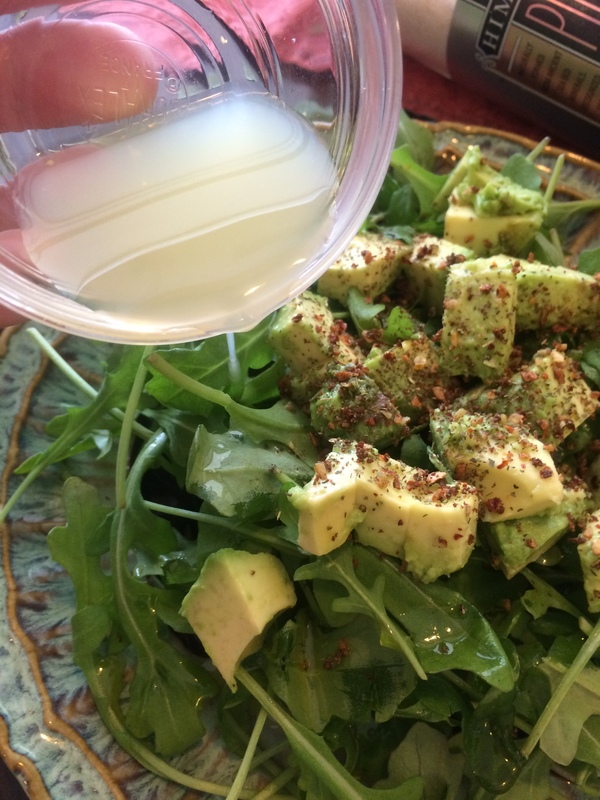 Drizzle lemon juice over avocado. Sprinkle salt and additional Mrs. Dash to taste.